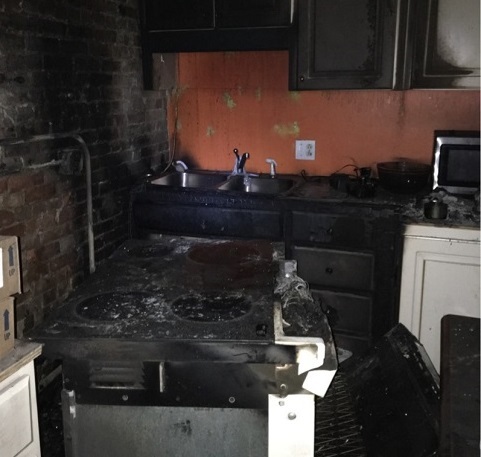 On Monday, January 15, 2018, Adonna’s Bakery in downtown Pensacola had a kitchen fire on the second floor. The upstairs kitchen and downstairs retail area were impacted by fire damage and damage from the water used to extinguish the fire. Since the bakery is in a commercial complex with adjoining residential and commercial units, the two adjoining residential units on the second floor also experienced smoke damage. The bakery is located in the historic district, which made staging vehicles and dumpsters and pulling permits difficult. The ceilings in the historic building, including those in the stairway, were 12 feet high, which meant OSHA would require scaffolding instead of the use of ladders. Work space was limited by the layout of the bakery; only a maximum of six people could be performing work at any given time. The interior exposed brick needed saving to preserve the historic ambiance of the building. Getting to work right away, Complete DKI’s team secured parking spots across the street for a roll-off dumpster and their crews were able to use the residential parking. They set up scaffolding in the stairway, as per OSHA standards, and built containment at the back of the bakery, so the front retail area could be cleaned without risking cross-contamination from the debris being removed from the source upstairs. Complete DKI also coordinated with 1-800-Packout to to perform cleaning and dry out of the affected areas during the same time as when contents were being cleaned, which minimized movement of the contents. To clean and deodorize the area while also preserving the historic integrity of the interior exposed brick, the team chose soda blasting because it was less abrasive than sand blasting. In order to complete the restoration by the bakery’s timeline, Complete DKI worked a double shift the first night to ensure all the equipment was set up for drying. Then, for the days following, they worked 12-hour shifts to remove the soot and smoke from the bakery and adjoining units. As Friday rolled around, the bakery was turned back over to the owners, just in time to make Gallery Night a success.